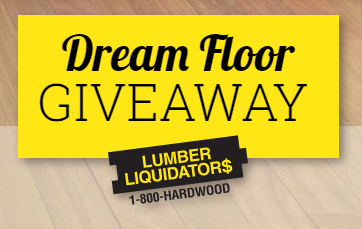 Lumber Liquidators Dream Floor Giveaway – Win $5,000 worth of flooring & more! Win $5,000 worth of flooring and $2,500! ELIGIBILITY – This Promotion is open only to legal residents of the 48 contiguous United States and D.C. who are 21 years of age or older as of the Promotion start date. SWEEPSTAKES ENTRY PERIOD – Beginning at 9:00 a.m. Eastern Time (“ET”) on December 28, 2016 until 5:00 p.m. ET on February 17, 2017. PRIZES – The Grand Prize Winner shall receive the following (the “Grand Prize”): (i) a gift certificate redeemable for $5,000 in flooring products from Lumber Liquidators, Inc.; and (ii) $2,500 cash (presented in the form of a check). Approximate retail value (“ARV”) of the Grand Prize: $7,500.